Back in school, we were encouraged to play in groups. Growing up, we were assigned projects where we were paired off with another student, or allotted to a team. Fast forward a few years, and we are sitting interviews where we are asked how well we work as a team, whether we work as a team, and how we would handle a crisis as a team. 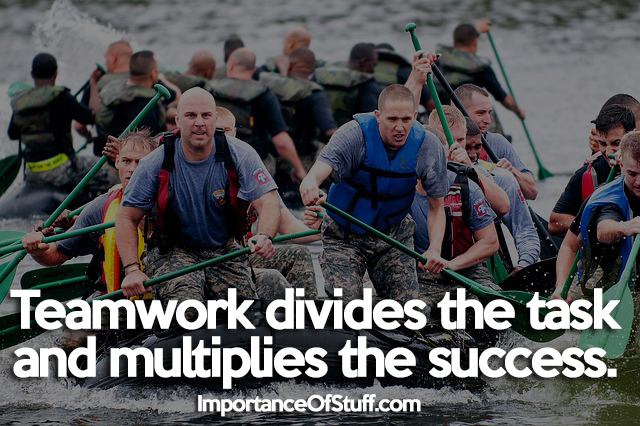 All of these experiences in life are designed with one goal; to teach us the value of teamwork. Here, let us find out why it is important to be able to work as part of a team. Creates responsibility: Any work is divided into components, and bringing those components together as a team creates and distributes responsibility equally. For instance, to deliver an infographic on time, you need graphic designers, script writers, and a manager. Each of these members of the team has a unique responsibility to fulfill, and each one is equally responsible to ensure that the entire infographic is created on time. For this to happen, each of the members of the team must come together and work in synergy, so that no one becomes a roadblock for the other. Work gets done faster: While work can get done single-handedly, it is not easy, and is definitely time-consuming. On the other hand, if work is divided among a team, responsibility is distributed; there are people for each specific component of the task, which gets done simultaneously. Each person is answerable to the other for smooth incorporation of the different elements into a coherent whole. Naturally, the task gets done in a much shorter time, and much more efficiently. Builds a healthy workplace: When each person is on their own at a workplace, there is the risk of the most unhealthy rivalry, which can lead to backstabbing and unwanted politics. If each person is part of a team, however, intra-organizational rivalry is down to a minimum. Each member of the team is responsible not just for themselves, but for the entire team as a whole. Mistakes made by the one person are borne by the entire team, so the members are bound to be more careful of and attentive to their work. Promotes healthy competition: Despite being part of a team, each employee is bound to look out for their own betterment. This creates a peer group environment, which prompts each member to perform better than the others, without bringing down the team solidarity and performance. With more effort being put into work by each member of the team, the workforce becomes stronger and more competent, and the organization benefits amply. Better solutions: When answers are needed, two heads are better than one. A team is able to discuss a situation on a more holistic level; each person brings their own perspective into the discussion, which gives the team a bird’s eye view of the scenario. Fresh ideas are brought into light as well. As a result, the organization becomes more adept at solving problems and starting new ventures. Provides learning opportunities: An individual working by themselves will get to learn only from their own mistakes, and probably make too many of them in the process. Being part of a team, however, will ensure that each member will also be able to learn from the others’ mistakes. Besides, different members will make different mistakes, and each will be a lesson in which paths to avoid. Most importantly, each member of the group will bring into the team a specific set of skills and knowledge, which will be passed on to and imbibed by the other members of the team, thus creating a wholesome learning environment. Motivation for employees: Companies that are able to encourage a healthy team spirit among its employees are more successful in their business and enjoy better employee retention. Being part of a team creates a peer group for the employees, forming a happy and enjoyable workplace environment. An employee with social bonds in the workplace is likelier to stay on and put in more effort and hours than an employee who flies solo. After all, for most people, the office is the place where the lion’s share of the day is spent, and it would be very difficult to spend that kind of time with no workplace camaraderie. Being part of a team in the workplace does not just make work easier, it also makes it enjoyable. Of course, it goes the other way too: a toxic team member can make each working hour well nigh unbearable. It is the employer’s responsibility to ensure that only people who are skilled and possessive of team spirit are hired, and the rest will be smooth sailing.